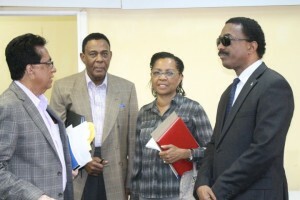 Left to Right: Senior Counsel, Seenath Jairam; Sir Richard Cheltenham; Queens Counsel, Jacqueline Samuels-Brown and Attorney General, Basil Williams at the Supreme Court Library Building where the Commissioners will be writing their report on the findings of the Walter Rodney Commission of Inquiry. The presentation of the Walter Rodney Commission of Inquiry Report to President David Granger on Monday hit a snag because the ink being used to print the document has finished. “Commissioner of the Walter Rodney Commission of Inquiry,Sir Richard Cheltenham did not submit the COI Report to President David Granger, as was scheduled to happen today. Sir Cheltenham reported that he was unable to make the 12:00 pm scheduled time because he had run out of ink to print the document. A detailed release will be sent out on the matter shortly,” the Ministry of the Presidency said in a brief statement. Sir Richard and the two other Commissioners arrived in Guyana last week to complete the writing of the report for its presentation to the Guyanese leader on 8th February, 2016. The report should have been presented to Granger since 30th November, 2015 but there have been several delays. Rodney was killed near the Georgetown Prison on 13th June, 1980 when a bomb-in-walkie talkie, which was given to him by a Guyana Defence Force electronics expert Sergeant Gregory Smith, exploded in his lap. At that time, Rodney and his Working People’s Alliance had been leading a civilian rebellion against what his party had called the Forbes Burnham-led dictatorship of the then People’s National Congress (PNC).